The German giant bearded dragon is popular with people looking for a pet lizard. This animal is generally docile, it's a beautiful color, and it's relatively easy to care for. But before you decide to adopt one, you might wonder how long it can live. The average life expectancy for a German giant bearded dragon is five to eight years, although they have been known to live up to 12. This is a longer lifespan than that of most domesticated lizards, so the giant bearded dragon is a good choice for a pet owner who wants to adopt a reptile with some longevity. However, if pet owners want their lizard to enjoy a long life, they should take certain steps to care for it. In spite of its name, the German giant bearded dragon originates in Australia and thrives in an environment similar to its native clime. The best cage flooring for them is a mix of sand and fine gravel. These lizards love to sunbathe, so keeping them in a terrarium with a heat lamp will suit them well. And because adult males can grow up to 30 inches long, it’s important to keep them in a terrarium with plenty of room. The German giant bearded dragon is an omnivore, and some of its favorite foods include greens such as kale and dandelion leaves. These lizards need a mix of fruits, vegetables, and insects to be their healthiest. Make sure that you’re feeding them commercially bred insects, as insects caught outside might have been exposed to pesticides. 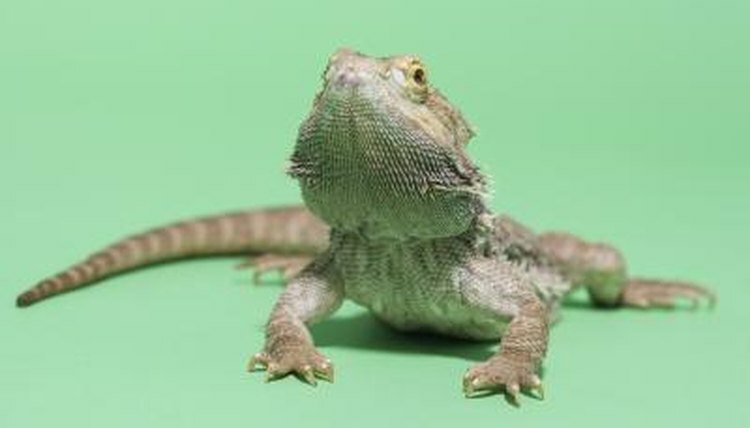 Also avoid feeding your lizard crickets and mealworms, as the giant bearded dragon cannot easily digest these. You should regularly clean your bearded dragon’s cage, using a mixture of 1/4 cup bleach with a gallon of water. Remove your lizard from the cage and wipe down the terrarium with hot, soapy water, rinsing thoroughly afterwards until you no longer smell bleach. You should also bathe your German giant bearded dragon about once a week to help him stay hydrated and to aid in his shedding. And although bearded dragons are generally healthy, you need to periodically take your pet to the vet to make sure he doesn't have parasites or infections. If you follow the guidelines for proper care, you can expect your German giant bearded dragon to be healthy and to live at least the average life expectancy for the breed.